Seeking lower costs, inexpensive color and long-term viability, Omaha Public Schools’ in-plant has replaced multiple offset and digital devices with a cut-sheet inkjet press. 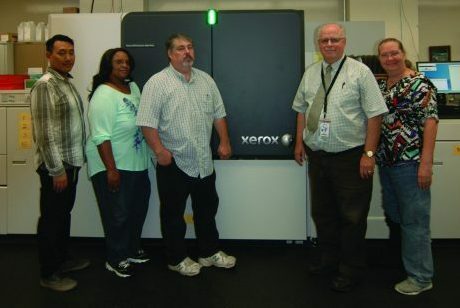 Standing with Omaha Public Schools’ new Xerox Brenva HD cut-sheet production inkjet press are (from left) Marc Peters, Lynette Woods, John Rodenbarger, Steve Priesman and Judy Lambert. Each year, as the long, warm Midwestern days began to wane and summer vacations came to a close for the students, faculty and staff of the Omaha Public Schools, the district’s in-plant stood ready to meet their ever-changing needs with a capable assortment of printing equipment. When classes started this year, however, there was one profound difference at the in-plant. Almost all of that equipment had been replaced by a single production inkjet press: a Xerox Brenva HD. In total, the in-plant removed four digital and two offset presses to make way for the Brenva and a new color toner device. The decision to make this transition to inkjet stemmed from Priesman’s concern over the long-term viability of offset. It was becoming increasingly difficult to obtain replacement parts for the Ryobi presses, he says. He also worried he would eventually have trouble finding skilled offset press operators. “For that kind of work, I felt that offset’s days were numbered,” he concedes. Seeking a productive alternative solution, Priesman first looked at toner-based devices, but found them to be too service-intensive. The new Xerox Brenva HD has reduced the cost of color printing for Omaha Public Schools. Standing with the inkjet press is Marc Peters. So about two-and-a-half years ago, Priesman started investigating production inkjet presses, and attended the Inkjet Summit. He recalls departing the 2017 event feeling impressed with inkjet technology. “That opened my eyes to the possibilities,” he admits. Priesman continued to do his research and collaborated with other inkjet press users, including the in-plant for the Houston Independent School District, which had already installed an inkjet press. After attending the Inkjet Summit again in 2018, Priesman decided the time was right to transition to inkjet. Priesman opted to remove all of the shop’s existing offset and digital color equipment. He also considered getting rid of all the in-plant’s digital monochrome equipment. So, as a compromise, the shop kept an existing Xerox Nuvera 120 monochrome machine. Joining it this summer was a new Xerox Brenva HD cut-sheet production inkjet press and a Xerox Versant 180 digital color machine. Priesman notes that the school district holds an annual surplus equipment auction, where he sold the shop’s offset presses, Mitsubishi platemakers and a Mutoh wide-format printer, which the in-plant replaced with an Océ Colorado 1640. He selected the Brenva because he felt a sheetfed inkjet device would best match the shop’s needs. He also knew he could do without a press that handled coated stock or heavy cover stock. Priesman felt that the Brenva’s capabilities were sufficient to handle 99% of the in-plant’s work. But he didn’t add the Versant just to handle the other one percent. The in-plant has implemented a second shift in order to be more responsive to its customers’ needs, without adding to the staff. The shop is home to 18 full-time employees and one part-time worker and boasts an annual operating budget of $2.2 million. Priesman says the cost justification to the school district for the new inkjet equipment was not a difficult process; the combination of lease and maintenance charges on the old equipment was similar to those of the new equipment. Where the in-plant really saved money, however, was by eliminating the costs of the offset equipment. The Brenva’s operating costs are also lower than those of the previous toner equipment. 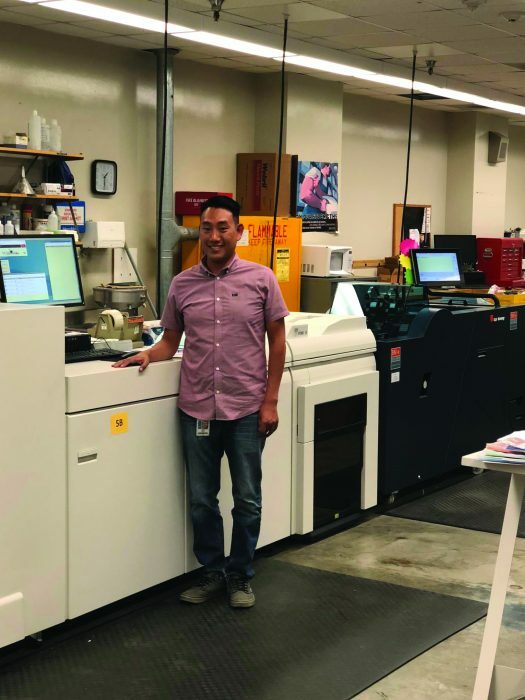 Offering the school district more color printing options was important to Priesman, who notes that the in-plant wants to help provide students and teachers with attractive materials that assist in the learning process. To assist in the print ordering process, the in-plant developed simple terminology to give customers an easy way to choose the best printing process for their needs. “Everyday color” is the term used for jobs run on the Brenva, while higher-end “prestige color” work is produced on the Versant. Everyday color is considerably less expensive, while prestige color is only recommended if there is a need for fancier coated stock or 100-lb. cover. The ability to print color for almost the same cost as black-and-white toner has enabled customers to add more color to their work. Priesman cites a recent mailer the shop ran on the Brenva. The job was printed in color on both sides and cost approximately $242. To show customers the difference, the in-plant has sent out samples. While it is too early to tell what the annual volume will be with the new equipment, Priesman expects it to be similar to 2017, when the in-plant churned out 50 million impressions on 33 million sheets of paper, while fulfilling 37,000 individual print orders. Fortunately, Priesman feels he has installed a reliable printing option to seamlessly serve the school district for years to come.